A new botnet called Hide ‘N Seek (HNS botnet) appeared in the threat landscape, the malware is rapidly spreading infecting unsecured IoT devices, mainly IP cameras. 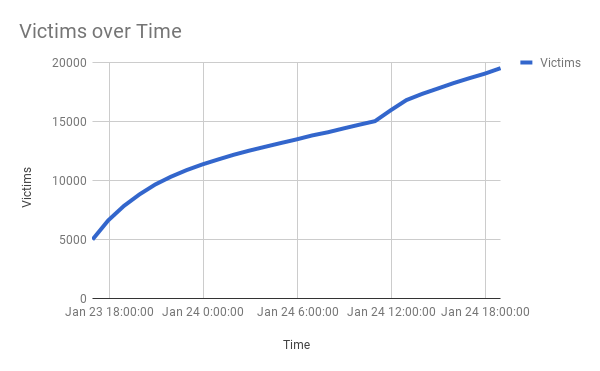 The HNS botnet was first spotted on January 10th by malware researchers from Bitdefender, then it disappeared for a few days, and it has risen over the weekend. The number of infected systems grew up from 12 at the time of the discovery up to over 20,000 bots, at the time of writing. “Bitdefender researchers have uncovered an emerging botnet that uses advanced communication techniques to exploit victims and build its infrastructure. The bot, dubbed HNS, was intercepted by our IoT honeypot system following a credentials dictionary attack on the Telnet service.” states the analysis from Bitdefender. Recently security experts spotted other IoT botnets, most of them linked to the Mirai botnet, such as Satori, Okiru, and Masuta, but the HNS botnet has a different genesis and doesn’t share the source code. Researchers at Bitdefender found similarities between the HNS and the Hajime botnets, unlike Mirai, Hajime doesn’t use C&C servers, instead, it implements a peer-to-peer network. Hajime is more sophisticated than Mirai, it implements more mechanisms to hide its activity and running processes and its modular structure allows operators to add new capabilities on the fly. The HNS malware is able to infect a series of IoT devices using the exploit as Reaper, the current version is able to receive and execute several types of commands, such as data exfiltration, code execution and interference with a device’s operation. According to the experts, the botnet is still under development, it doesn’t include DDoS capabilities, a circumstance that suggests it is intended to be deployed as a proxy network. “While IoT botnets have been around for years, mainly used for DDoS attacks, the discoveries made during the investigation of the Hide and Seek bot reveal greater levels of complexity and novel capabilities such as information theft – potentially suitable for espionage or extortion.” concluded Bitdefender. The bot spread by randomly generates a list of IP addresses that could be potentially compromised. It then initiates a raw socket SYN connection to each potential target and continues communication with those devices that answer the request on specific destination ports (23 2323, 80, 8080). Once the bot has established a connection it will look for a specific banner (“buildroot login:”) presented by the victim. If it gets this login banner, it attempts to log in using a list of default credentials. If the credentials are not correct, the botnet launches a dictionary attack using a hardcoded list. Once connected to the victim, the malware will run through a “state machine” to determine the type of target device and select the most suitable compromise method. Experts explained that if the device shares the same network with the bot, the bot sets up TFTP server to allow the victim to download the malicious code from the bot. If the victim is located on the internet, the bot will attempt to use a specific remote payload delivery method to get the target device to download and execute the sample. “These exploitation techniques are preconfigured and are located in a memory location that is digitally signed to prevent tampering. This list can be updated remotely and propagated among infected hosts.” continues the analysis. Experts observed that the HNS botnet cannot establish persistence on infected devices, once the device restart, the malware will be removed, this means that botnet operators have to continuously manage the HNS botnet.